Yes - Rypin in Płock Gubernia. ok, very close to the place i live. im trying to decipher the handwriting. I would be most grateful for translation of the names, dates and locations on this birth record. Thank you. It happened in the city Rypin on the 30th day of June. Appeared citizen of the city Rypin Icek Majer Lewitan 36 years old and presented a female child in the presence of the witnesses, citizens of the Rypin ciy: teacher Szmul Lichtenstein, 30 years old and Szlema Brodawka, 62 years old and informed that the child was born in the city Rypin on the 27th day of the current month with his legal wife Dacha nee Niedobitek, 36 years old. and city mayor, serving as civil registrar. Ah great - thank you! 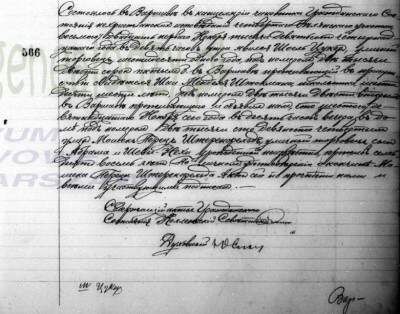 Hello, I need translations of two documents for Ignacy Pawyza. I am confused if these are for the same person. 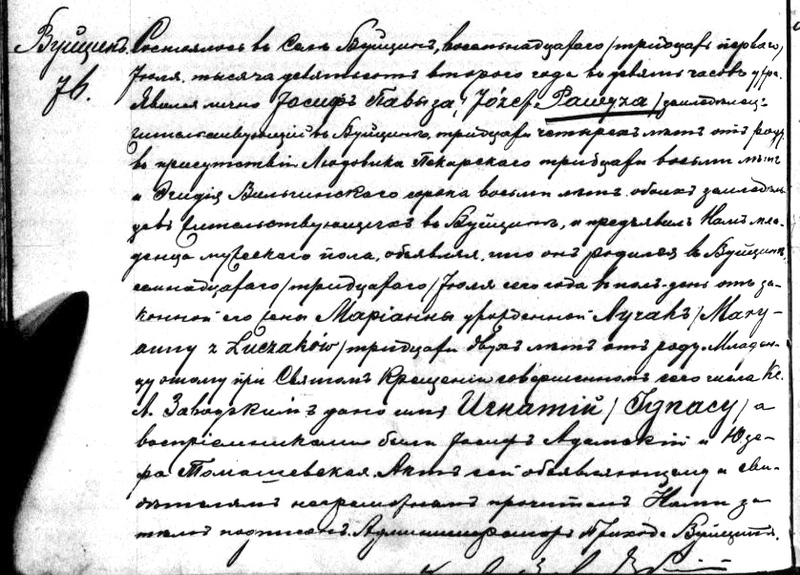 There is a notation on the bottom of one referring to a death of Ignacy in 1905. Please clarify with a translation. Thank you in advance. Good morning. 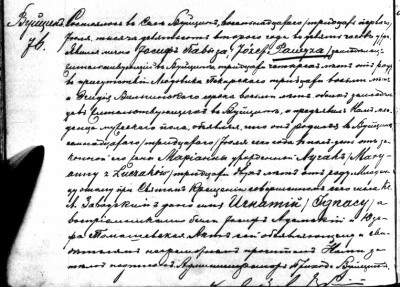 Will you be willing to translate for me two church wedding records? The first one is the 1874 marriage of Jan Daniel Zielke and Euphrosyne Kessler, I believe in Telazna. 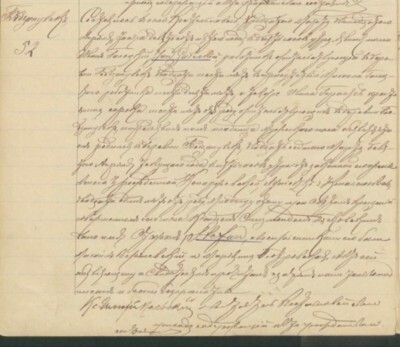 The second one is the 1886 marriage of Gustav Krueger and Euphrosyne Kessler, now the widow of Jan Daniel Zielke, and I believe this marriage was in Adaminowo. Thank you very much! My regards, Doug E.
regarding to the bride's birth place there is discrepancy in these two marriage records. 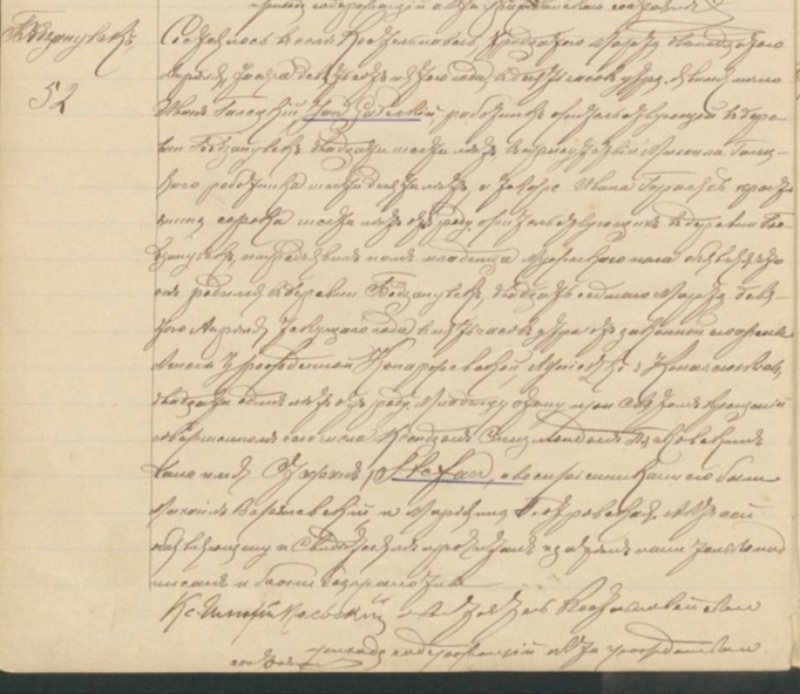 It would be great if You could send the better quality of the marriage record from 1886. On the left marigin of this marriage records there is also information about the birth records so i guess they were included as a so called "allegata" to this marriage record. I dont know the source of this marriage record. Can you show it to me? This marriage was preceded by 3 banns announced on the 10th/22nd day of August on Sunday and on the next two Sundays in Evangelical-Augsburg church in Nowa Wieś. Jan Daniel Zielke, a single man, 22 years old, servant living in Smolniki, born in Zuzałka, son of late parents: daylaborer Jan Daniel Zielke and his wife Julianna nee Schmidt. Birth record number 29, 1852. Eufrozyna Kessler, a miss, 18 years old, born in Siarzewo, daughter of late farmer Michał Kessler and his wife Karolina nee Flinta, second marriage name Hinz, servant living in Telążna. This marriage was preceded by 3 banns announced on House of Prayers of Nowa Wieś Evangelical-Augsburg church on the 2nd/14th day of September 1873 on Sunday and on the next two Sundays. 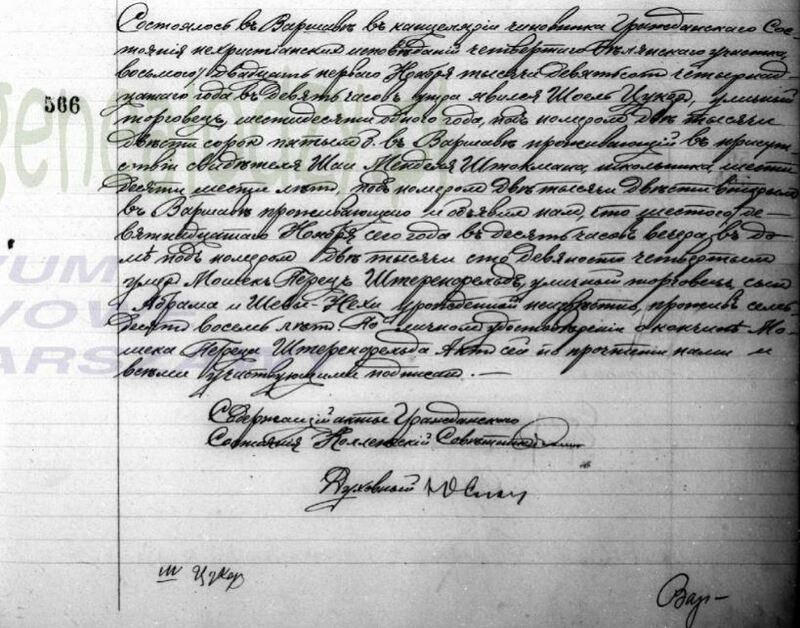 Brides family gave permission for this marriage on the 18th/30th day of December 1873, what was written in protocol at Łęg community mayor office. This act was read aloud to the newlyweds and witnesses, all illiterate and signed by Us. 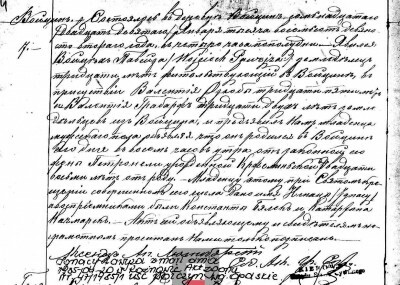 Marriage of Łukasz Bogal, son of Józef and Katarzyna Bochenski, born in Kolosy, Sokolina Parish, and Salomea Pruska, Kargów Parish. It happened in Kargów on the 15th/27th day of October 1885 at 10 a.m.
Salomea Pruska, a miss, 20 years old, daughter of Andrzej and late Jadwiga nee Olszewska, born and living with her father in Bosowice. 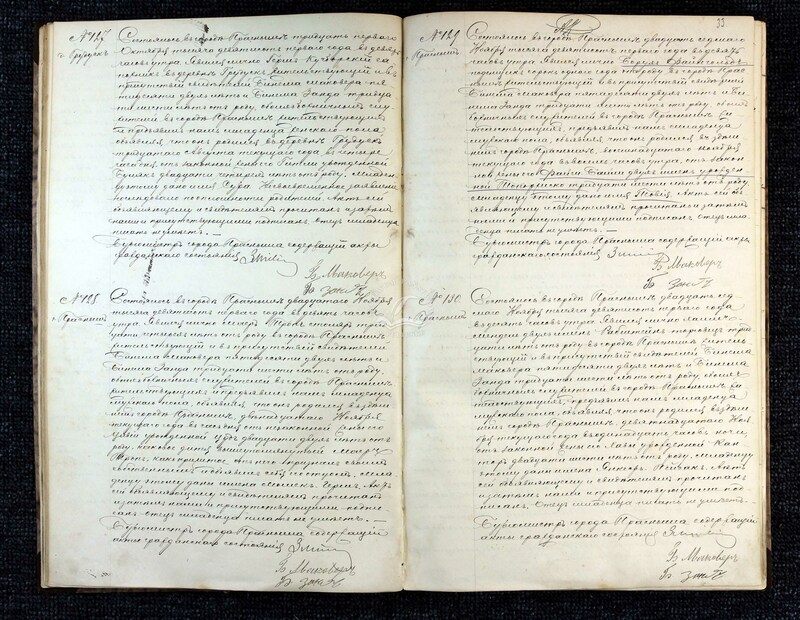 This marriage was preceded by 3 banns announced in Kargów parish church on: 22 September/4 October, 29 September/11 October and 6/18 October of the current year. Bride's father, present during writing of this marriage act, gave oral permission for this marriage. Religious rite of the marriage celebrated by Us. This act was read aloud to the present and because of their illiterance signed only by Us. 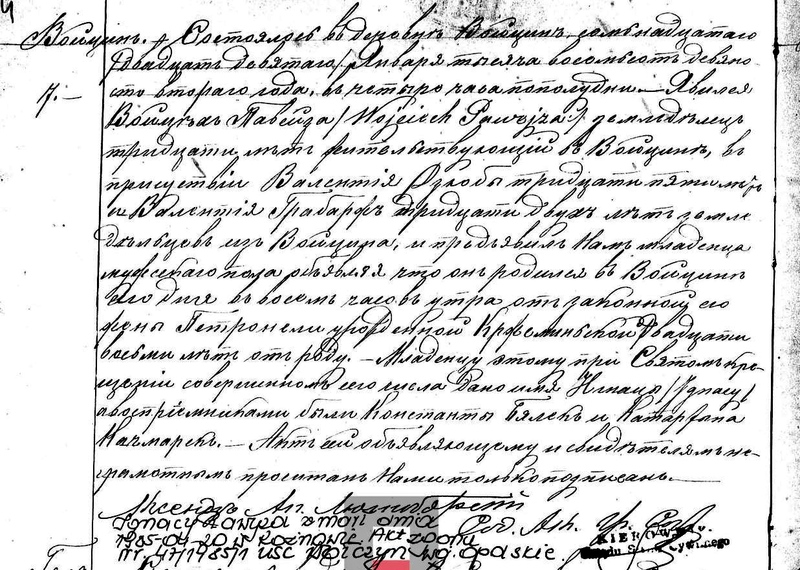 Please help translating this birth record. Thank you! It happened in Rypin on the 10th/22nd day of November 1899 at 5 p.m. 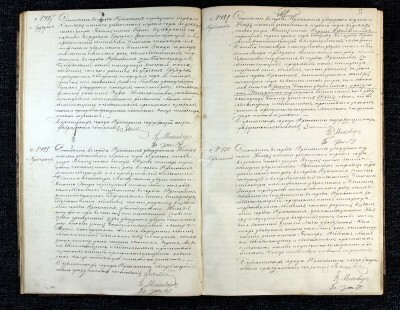 Appeared Franciszek Rzeziński, potter from Rypin, 27 years old in the presence of Walenty Łażewski, 42 years old and Marian Jaszczak, 33 years old, workers from Rypin and presented us a female child informing that the child was born in Rypin on the 20th day of October/3rd day of November of the current year at 3 p.m. with his legal wife Leokadia nee Janiszewska, 22 years old. At The Holy Baptism held today the child was given the name Genowefa and the godparents were: Antoni Szpanielewski and Eleonora Gronowska. priest A. Smoliński, Rypin parish administrator, serving as civil registrar. 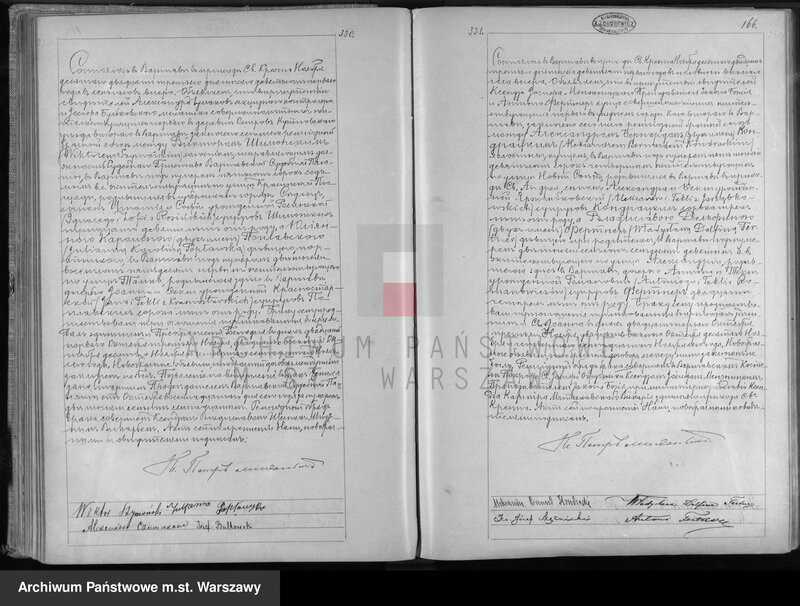 left marigin: On the basis of Rypin County Court order dated 19th day of December 1963, case number 553/63 this act shall be rectified in this way: instead of name Rzezińska there should be written Wrzesińska, daughter of Franciszek Wrzesiński. It happened in Kościelna Wieś on the 30th day of March/12th day of April 1905 at 10 a.m. Appeared in person Jan Gałecki, worker, living in the village Bodzanówek, 26 years old in the presence of Michał Gałecki, worker, 60 years old and Jan Gorylas?? ?, peasant, 46 years old, both living in the village Bodzanówek and presented Us a male child informing that the child was born in the village Bodzanówek on the 27th day of March/9th day of April of the current year at 5 a.m. with his legal wife Agnieszka nee Konarzewska, 21 years old. At The holy Baptism held today by the priest Zygmunt Piaskowski the child was goven the name Stanisław and the godparents were: Michał Waralewski? and Marianna Piotrowska. This act was read aloud to the declarant and witnesses, all illiterate and signed only by Us. priest Hipolit Majewski signature, Kościelna Wieś parish parson, serving as civil registrar. Dziękuję za tłumaczenie. Doceniam to bardzo. Czy zmarły w tym dokumencie pana SZTERENFELDA zostawił swoje potomstwo? witnesses informed that on the 6th/19th day of November of the current year at 10 p.m. died in Warsaw in the house number 2194 Moszek Perec Szterenfeld, street trader, son of Abram and Szewa Necha of unknown maiden name, 78 years old. no info about family members. There is no info who the witnesses are for deceased person. It happened in the city Przasnysz on the 31st day of October 1901 at 9 a.m. Appeared in person Hersz Kuczborski, shoemaker, living in the village Grudusk in the presence of the witnesses Binem Makower, 52 years old and Binem Zand, 36 years old, both synagogue servants living in the city Przasnysz and presented us a female child informing that the child was born in the village Grudusk on the 30th day of August of the current year at 4 p.m. with his legal wife Gitla nee Bulak, 24 years old. The child was given the name Sura. The late announcement of the birth of a child results from the mistake of parents. This act was read aloud to the declarant and witnesses and signed by us and them. Child's father is illiterate. Can you please translate this record. Not sure on the language. Record 331 Alexander Kondracki - Thank You.